(August, 2012) Hi, my name is John "Flip" Phillips. I was born and raised a long time ago in a little town in New Jersey called South Amboy. 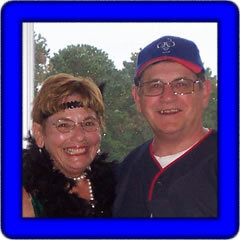 I have been married for almost 50 years to my Iris and we now live in an over 55 golf community in south New Jersey, about 25 miles north of Atlantic City. It's call Sea Oaks and it's on the Internet if you want to take a look. 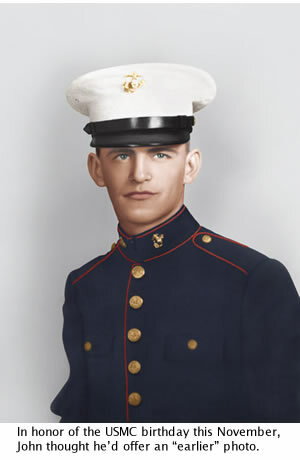 After high school, I joined the U. S. Marine Corps and spent the next several years "growing up". When I was discharged, I returned home, met Iris and started a family. We have three children and four grand kids. I got a job with the DuPont company and then spent the next eight years going to night school. I finally got my accounting degree and the company promoted me and sent us to the home office in Wilmington, Delaware. My primary focus was international accounting with Europe as a primary responsibility. I have been "across the pond" many times and still have friends in Germany. Now the Music: My mom, a strong-willed Polish lady, decided I was going to be her accordion player. I kicked and screamed, but to no avail. I took lessons and, to my surprise, liked it and got good at it. Good enough that I was asked to play in a "Polka Band" with some older kids in town. Then came high school and sports and girls. I stopped playing the accordion so my mother made it vanish. About 20 years later, she walked in one day with another accordion and says, "Here, you fool, play it." I did and after a while it all came back. Somewhere along the way I got interested in keyboards and started the journey up the line. I now have a PSR-S900, but am sure it won't be my last. Right now, I am the resident keyboard player for our community and I play at a lot of events. I only charge expenses and welcome payment in the form of rounds of golf or wine. I have recorded about 100 songs in the MIDI format and many have lyrics. I have also recorded several CD's and pass them out to anyone who likes my music. So, my mom had her way after all, and every time I play the keyboard, I think of her and the wonderful gift she forced me to have. Oh, and I am also half Irish as my father came from a little town in Ireland called Arklow. That's some mix. Polish and Irish, only in America. I hope you like my music as much as I like yours. Note: in summer of 2012, John moved up to a Tyros4. You will find more of John's songs on YouTube. 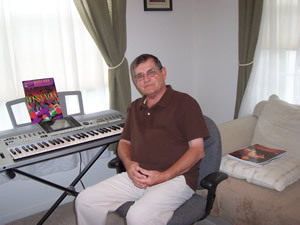 John has provided 160 songs in midi format. These were created on the Tyros4 (T4) or the PSR-S900 (S9). Individual songs are shown in the table below and any one song can be downloaded by right-clicking on the song link. You can download all of John's MIDI songs here: FP-150.zip. Christmas MIDI songs are in V14.zip and V15.zip. Latest 10 songs are in V16.zip. The table displays the song title, tempo (T), time signature (TS), lyrics (L), chords (C), where possible, the style used, the original volume (V), and the keyboard used (K). John's songs are arranged alphabetically by song title. (v) indicates the song includes a vocal by John. Click on the song title to listen to and/or download the song.